Food and Drink, from Michelin starred restaurants to a cafe by the beach, to the humble pasty. Cornish Pasty No visit to Cornwall is complete without sampling a "proper Cornish pasty". Straight from the baker's oven, piping hot, held by the crust or paper bag wrapper of course. There is nothing better, than on a warm summer's day, finding a sunny spot in which to sit and then eat your pasty. Island View Cafe Looe. Overlooking Looe Island and the Bay. Dog & child friendly. Quirky, with its pastel coloured tables, but with views to die for. Well worth seeking out. From freshly prepared sandwiches to a cream tea. A friendly relaxing place. Polpeor Cafe The Lizard Location location location. Good food with a view. Situated at Southerly Point on the Lizard. Maybe a seal playing in the sea below. Table service, with tables inside and out. Their fish and chips are recommended, as is their home-made Meringue . Often open in the winter too, but please do give them a call to check first if making a special visit. Poldhu Beach Cafe In a most beautiful setting right on the beach. "Open 363 days a year", they only close on Xmas day and Flora Day. From mouth watering ciabatta, to burgers. With a very friendly owner. A shop too, in case you have forgotten that sun cream, hire a surf board or a wet suit. Chapel Porth Cafe Situated hidden down a narrow valley near St Agnes, tucked into the corner of the beach car park. Forget calorie counting, you must try their hedgehog. 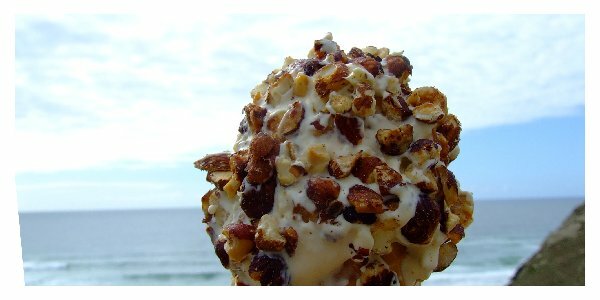 Cornish ice cream topped with a huge dollop of clotted cream, all rolled in honey roasted nuts. Mouth watering does not describe it - what an assault on the taste buds. The Gurnards Head. 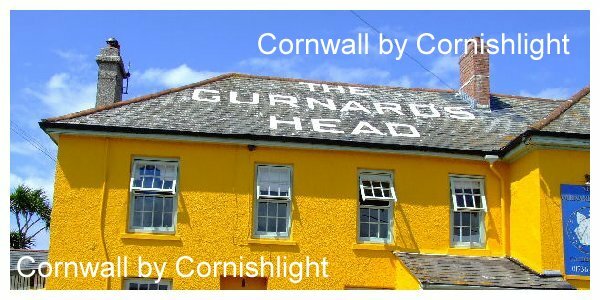 Yes it is really painted a bright yellow ochre, so easy to find when driving along the St Ives to Lands End road. They too modestly describe themselves as "a pub with dining rooms". A very laid back and relaxing atmosphere. An enviable reputation for simple but stylish food. Open for lunch and supper. Full of charm, wooden floors, local art on the walls. In winter a log fire blazing in the bar. A ten minute walk across fields to the Coast Path. Visit and savour its remote location. Boscastle Farm Shop A short walk from the coast path, with far reaching views from the picture windows. So friendly staff. We recommend the quiche of the day with a salad garnish, followed by one of their home-made deserts. For a light lunch, what about their home-made soup? Try locally reared Ruby Red beef. The Sunday roasts, and Christmas lunches are renown too, but please book ahead. Outdoor seating too. Saffron bun or cake. View our Cornish saffron cake recipe. Yes you can now buy saffron buns by post. 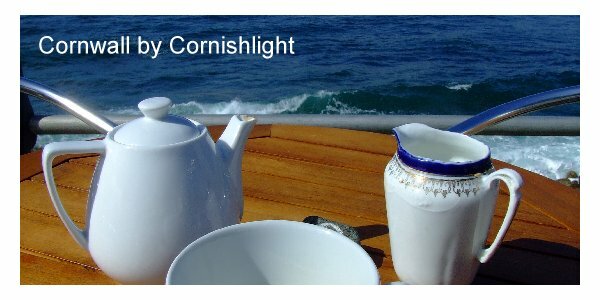 Did you know saffron was first introduced to Cornwall by the Phoenicians, visiting the county to trade tin? No page on Cornwall Food would be complete without a mention of the pilchard. Once present in huge shoals, caught, salted and packed into barrels for export. Now a sustainable fishery, marketed as the Cornish Sardine. More on the Pilchard here. The Seafood Restaurant Opened by Rick Stein in 1975, famed for its cuisine and high standard of service. If fully booked try Stein's Fish and Chips, Cafe or Bistro, also in Padstow.